With seasonal colds taking over my family, I crave hearty soups for their warm comfort and vitamin packed meals. Soup is the perfect winter dish as it can be made in advance, frozen, and reheated for quick family meals. I adore squash and pumpkin for their buttery flavours and their versatile use. 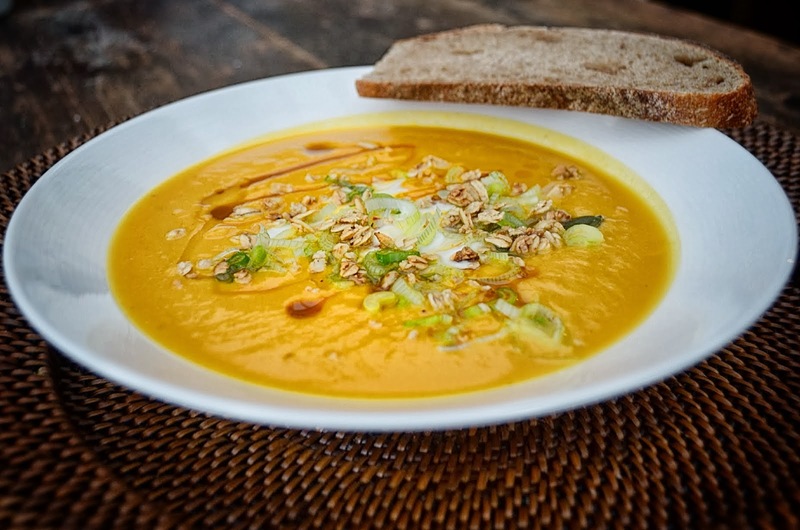 A favourite soup of mine is butternut squash which is the star ingredient in this amazing recipe. There are several steps involved but keep in mind: 1) some prep can be done days in advance and 2) if you make a big enough batch you can enjoy 2-3 meals for all your efforts. Peel and roughly chop onion. Add to baking dish. Peel garlic and add whole cloves to baking dish. Drizzle squash halves with olive oil. Sprinkle dried seasonings and drizzle honey over squash halves. Place fresh herbs directly onto squash. Pour 1/2 cup of water into base of Pyrex. Roast squash for 1.5 hours or until cooked through and tender. If edges of the squash begin to burn, cover the dish with foil and finishing baking. Remove from oven and allow to cool enough for handling. * May use all apple or all orange juice if preferred. Scoop out flesh from squash. Puree roasted squash, garlic, onions, vegetable stock, whole milk (or cream) and 2 tablespoons of butter until well blended. Bring puree to a low boil and add in remaining butter, juice and yogurt. Allow soup to simmer on low boil for 15 minutes, whisking regularly. Serve hot with suggested garnishes. The squash may be roasted a day or two in advance. If you prefer to buy fresh cut squash, cooking time will vary. The squash may be boiled in vegetable stock with fresh herbs. Additional seasoning would then be added once squash is pureed. I personally prefer roasting the vegetable as it infuses the flavours of spices and seasonings in the squash. The consistency of the soup should be smooth and not too thick. If soup seems too thick, add another tablespoon of butter and 1/4 tsp of yogurt. Soup may be kept refrigerated for up to one week.